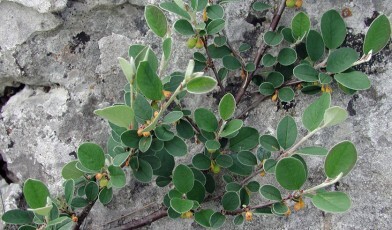 Wild cotoneaster, also known as the Great Orme Berry because of its red globular berries, is endemic to Britain. It grows on isolated and exposed cliff edges on the massive carboniferous limestone headland of the Great Orme in Caernarvonshire, Wales. This species was first discovered in the eighteenth century when it was described as being widely distributed in its current location. However, the plant attracted Victorian plant collectors and this together with over-grazing by rabbit, sheep and goats led to it being believed to be extinct, until a small population of six remaining individuals was discovered. These six individuals are thought only to have survived because they could not be uprooted. The species is Critically Endangered in the wild and the locations of individuals is now kept confidential, except for one which is widely known. Cotoneaster cambricus is a long-lived deciduous shrub with green oval leaves and a grey, woolly underside. The flowers are light pink in early summer and in autumn the berries are small and bright orange/red in colour, resembling miniature apples. This species has low seed productivity and germination and any seedlings that do germinate are hindered by grazing. Reintroductions of new plants grown in cultivation have been reasonably successful and the population in 2003 stood at 17 individuals. 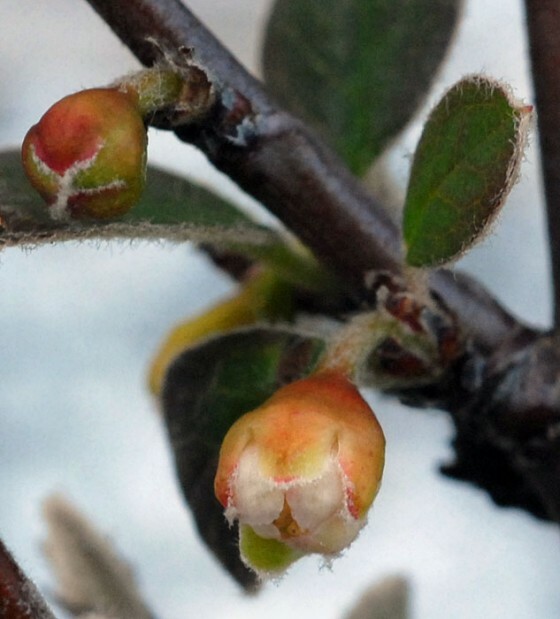 There is some uncertainty about the taxonomy, it has been suggested that wild cotoneaster is not significantly different from Cotoneaster integerrimus found on the continent and that it may be a subspecies or variety. Genetic studies are underway to resolve this issue but conservation continues in the Great Orme to protect these unique and interesting individuals.